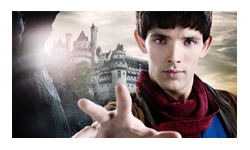 Merlin is a great example of what the BBC excels at – the great British institution of Saturday evening family entertainment. American mainstream television doesn’t seem to have an interest in producing this stuff, but if the success of BBC America (and I guess syfy channel fair such as Warehouse 13 and Eureka), is anything to go by there’s definitely a market for it. The Autumn season of Merlin is the perfect counterpoint to the spring season of Doctor Who – two shows which understand the balance between cheesy jokes and action for the kids, with character development and intricate backstory and mythology for the adults. Merlin is more kiddie oriented than Dr Who, there are far more jokes about bodily functions and the plots are generally pretty straightforward. The villains are all about long lingering evil looks and flouncing about the place. The ‘next time on Merlin’ sequences were often eye-rollingly frustrating this season, the brief trailer for the next episode seemingly packed full of repetitive motifs (a character falls for someone who’s not what they seem) and crawlingly slow character development (Gwen and Arthur look longingly at each other again). But actually when the episode rolls around there was always something new and the episodes were always entertaining. The key to Merlin is the interactions of the characters and the humour they find everywhere. The banter and teasing is played with perfect timing, both laugh out loud funny and feeling perfectly natural. The contrast of these lighter moments with the weight of destiny which is clearly pushing on them all is nice managed, the jeopardy never so much as to get overwhelming. There’s the added satisfaction of seeing the elements of Arthurian legend slowly come together, not starting from where you expect, but gradually working their way together. Merlin is one of the staple shows in my house –excellent storytelling (all be it occasionally working with somewhat repetitive plots), entertaining writing, charming acting, beautiful costumes and locations, and a healthy dose of people hitting each other with swords add together to make near perfect Saturday evening entertainment. Season 2 was more kiddie oriented in my opinion. I think season three returned to the more serious tone of season 1.